The band Coreyah will take the stage at 7:30 p.m. Tuesday, Sept. 25, in Hewitt Hall ballroom to showcase its "mesmerizing" twist on traditional Korean music with contemporary influences. Miranda Traudt, as SUNY Oswego's director of arts presentation, attended a Coreyah concert in New York City before booking the ensemble to lead off the 2018-19 Artswego Performing Artists Series. "I'm new to this genre, and I couldn't turn away… If I had to pick one word to describe them it would be mesmerizing,” Traudt said. A reviewer for ThreeWeeks gave the band four stars, calling its music, "Infectious … a beautifully layered sound." As part of the Artswego's Performing Artists Series, the six-member Coreyah will perform its brand of traditional music with inspiration from assorted genres -- Anglo-American rock, Balkan gypsy and a variety of forms from South America and Africa. "The name of the group, the Sino-Korean homonym Co - Re - Yah, refers to inheritance of the past, but now serves to draw living modern people toward more attractive music using old music elements," according to the band's New York City-based agency, Sori. Formed in 2010, Coreyah's members use traditional instruments of Korea, such as the janggu (a horizontal, two-sided drum), the daegeum (bamboo transverse flute) and the geomungo and the yanggeum (lap-held stringed instruments). Other instruments are more recognizable: the guitar and modern drums. "Many of their songs are energetic," Traudt said. "I connected to a lot of the different sounds." The band has caught the attention of audiences across Canada and in other parts of the United States during earlier tours. On the current tour, Coreyah will play in Albuquerque before and at the Kennedy Center in Washington, D.C., after its Oswego appearance. Coreyah’s performance is cosponsored by the ALANA (African, Latino, Asian and Native American) Student Leadership Conference, Sept. 21 to 29 on campus. The concert will help highlight the weeklong series of multicultural events that takes place annually at SUNY Oswego. The college's Institute for Global Engagement, which promotes awareness, knowledge and respect for diversity, also helped bring Coreyah to campus. IGE is the organizer for SUNY Oswego's annual "Year of" series, this year focused on Korea. The members of Coreyah will hold a workshop for students taking "Introduction to Worlds of Music" to explain their instruments and demonstrate how to play them. 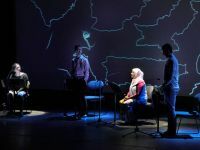 For an arts management class, they will share administrative concerns such as the complexities of traveling as an international group and touring in the United States. In the "Music and Politics" class, ensemble members will explain how the political climate in Korea has influenced their music. Tickets for Coreyah are $20 ($5 SUNY Oswego students and other students in grades K-12), and are available at all SUNY Oswego box offices, online at tickets.oswego.edu or by calling 315-312-3073. People with disabilities needing assistance to attend should call 315-312-5420 in advance of the concert. Parking is included in the price of a ticket and is available in the employee and commuter lots behind Hart and Funnelle residence halls. For more information, visit oswego.edu/parking.